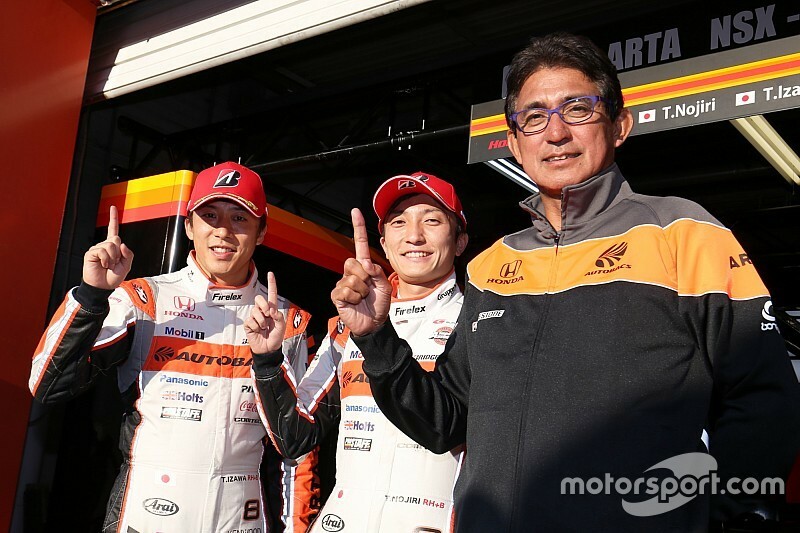 Tomoki Nojiri and Takuya Izawa scored pole position for the Super GT title decider at Motegi, leading an all-Honda top three as Jenson Button and Naoki Yamamoto qualified second. 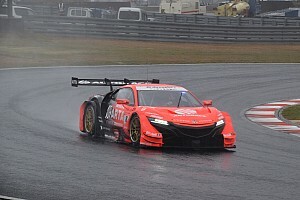 ARTA Honda driver Nojiri established a new lap record in the closing stages of the 10-minute Q2 pole shootout, setting a best time of 1m35.550s in the #8 NSX-GT - almost eight tenths up on the old record. It was enough to edge out the joint championship-leading #100 Team Kunimitsu Honda by 0.189s, denying Button and Yamamoto what could have been a crucial bonus point for pole. Button and Yamamoto are level with TOM'S Lexus pair Nick Cassidy and Ryo Hirakawa heading into the Motegi finale. "For us [second] is a good position, the most important was to be ahead of the #1 car [Cassidy and Hirakawa]," said Button, who topped Q1. 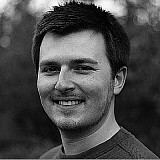 "It makes it a tiny bit easier but we know it won't be an easy race." Cassidy managed to secure a Q2 spot in the #1 Lexus LC500 with the seventh-fastest time in Q1, but Hirakawa could manage no better than sixth in the shootout, 0.684s off the pace. Bertrand Baguette put the #64 Nakajima Racing Honda third ahead of the best of the Lexus runners, the #38 Cerumo car of Yuji Tachikawa and Hiroaki Ishiura. 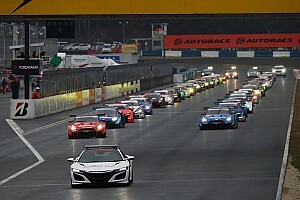 Real Racing pair Koudai Tsukakoshi and Takashi Kogure made it four NSX-GTs in the top five in fifth place. The biggest surprise in Q1 was the elimination of the #36 TOM'S Lexus of Kazuki Nakajima and Yuki Sekiguchi, who lies third in the standings, 12 points down on the two leading cars. Nakajima was slowest of all in Q1 after making an error on his hot lap, consigning the #36 car to 15th on the grid. Nissan also endured a difficult qualifying session, as three of its four cars dropped out in Q1. Satoshi Matoyama and Katsumasa Chiyo were the marque's highest-placed representatives in eighth in the #3 B-Max GT-R.
Kazuki Hiramine took pole position in the GT300 class with a best time of 1m45.911s in the #88 JLOC Lamborghini Huracan GT3 he shares with Marco Mapelli. Title contender Naoya Gamou fell just 0.097s short of Hiramine's time in the LEON Racing Mercedes-AMG GT3. Gamou and teammate Haruki Kurosawa's outside championship hopes were boosted by points leaders Sean Walkinshaw and Shinichi Takagi only managing 10th on the grid in their ARTA BMW M6 GT3. 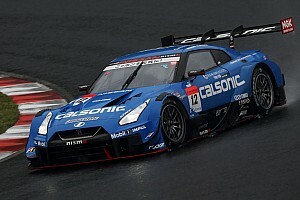 Takagi set the second-fastest time in Q1 behind Hironobu Yasuda (#11 Gainer Nissan GT-R GT3), but Walkinshaw was over a second off the pace in Q2.